Creator Tilly set up this stylish and vintage-themed blog to initially track her sewing progress and gain tips and advice after she first started sewing. Now however, her blog is a fantastic source of all things informative and inspirational, as she has fallen in love with sewing. Her Learn to Sew section is the perfect starting point for newbie seamstresses, as she takes you through all the basics, including how to set up your sewing machine, and tackling many FAQ’s. The Things I’ve Made section is a gorgeous gallery of all her handmade clothes, in her typical retro style, while the How To section gives handy tutorials on how to make accessories such as a bow belt and a fabric necklace. 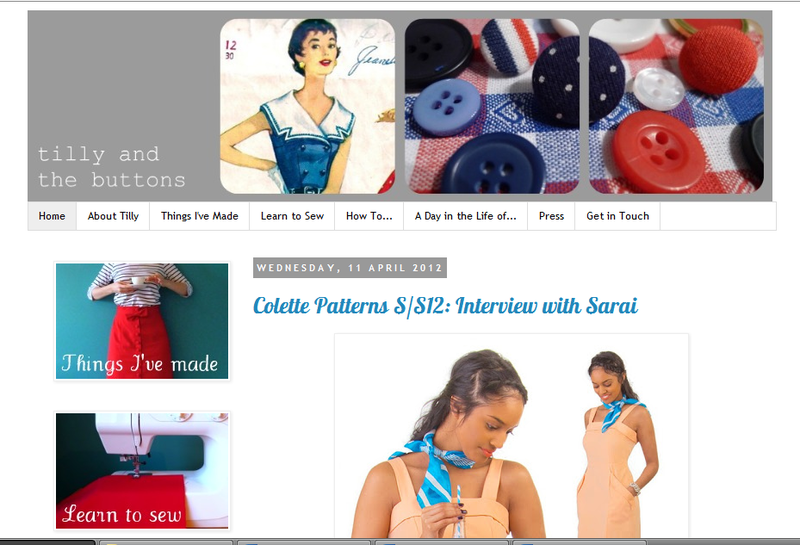 She even has a Day in the Life section, where she talks to people working in the world of sewing, asking them how they turned their passion into a career. A truly great blog that covers so much – definitely worth a read. If making clothes if your forte, then you should have a look at Gigi’s sleek and stylish blog Behind the Seams. She talks about all the patterns she’s used as well as how and why she may have adjusted them, providing an informative and useful guide for readers who may wish to do the same. There are plenty of pictures for you to look at, showing clearly how Gigi goes about her recent sewing projects and as she also dabbles in couture creations, you get to see clothing a bit more out of the ordinary as well. Very much a family affair, mother and daughter run blog Sew Chic, focuses on clothes making, and how to adjust them to be suitable for the various members of the family. Mother Ruth and daughter Jessica not only create tops and dresses for themselves but also make a lot for their children (Ruth has seven kids and Jessica has two), so if you are thinking about sewing for your little ones, this is a great place to look for patterns and fabric inspiration, as well as how to change the patterns to be just how your child wants it! They talk through all of their sewing patterns, offering their advice and thoughts, making a really comprehensive and useful site that is singing with sewing passion! Let us know what sewing blogs you’re reading! Do you have a sewing blog?